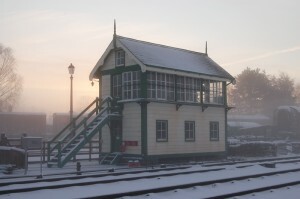 The signalbox at Quorn & Woodhouse is situated at the south end of the station on the Up side of the line, close to the location of the original box. The box was originally located at Market Rasen and is an MS&L box of circa 1886 vintage – making it the oldest structure on the railway. The structure is all wood and was erected on a new concrete base. The box controls the station area and sidings. There are several signals of interest. At the north end of Platform No.1 there is a mechanical colour light signal and the Down lie-by exit is a GCR lower quadrant signal. Mechanical inner distants (accelerating distants) have been provided, together with colour light outer distants (these auto distants are not lever operated). There are detonator placers for both Up and Down lines. The points are mechanically worked, except for the crossover road between the Up and Down lines situated north of the station bridge, which is motor worked. The box was originally intended to control a passing loop and work was done on this scheme in the latter half of the 1980s. Following the opening of the Double Track project in 2000, attention switched to Quorn & Woodhouse and the box was commissioned in 2004. This signalling scheme won a Westinghouse Signalling award. Technical information: The signalbox works absolute block on the double line to the north and south of the station and can be switched out after the main running line signals have been cleared. It has a 29 lever MS&L frame with direct tappet locking. The signal box has an illuminated diagram of 1940s vintage. Point motors are HB type 30V machines. DC track circuits are provided.